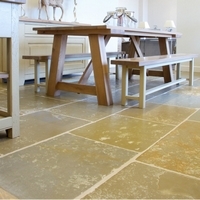 Ca'Pietra Tiles.Oxley Limestone Worn Floor tiles. Ruggedly time-worn in appearance, this limestone is full of character. Each tile is uniquely patterned and marked, with fettered edges and smooth natural undulations, so that you'll find them virtually indistinguishable from antique flagstones.